"Goosefoot" redirects here. For the unrelated "Mercury goosefoot" plant, see Aristolochia rotunda. 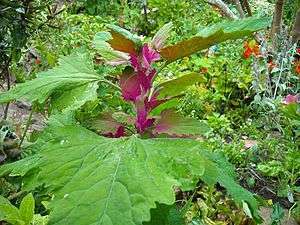 The species of Chenopodium (s.str., description according to Fuentes et al. 2012) are annual or perennial herbs, shrubs or small trees. They are nonaromatic, but sometimes foetid. The young stems and leaves are often densely covered by vesicular globose hairs, thus looking farinose. Characteristically, these trichomes persist, collapsing later and becoming cup-shaped. The branched stems grow erect, ascending, prostrate or scrambling. Lateral branches are alternate (the lowermost ones can be nearly opposite). The alternate or opposite leaves are petiolate. Their thin or slightly fleshy leaf blade is linear, rhombic or triangular-hastate, with entire or dentate or lobed margins. Inflorescences are standing terminal and lateral. 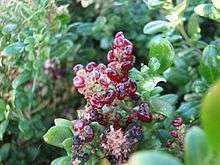 They consist of spicately or paniculately arranged glomerules of flowers. Plants are monoecious (rarely dioecious). In monoecious plants flowers are dimorphic, bisexual or pistillate. Flowers consist of (4–) 5 perianth segments connate. basally or close to the middle, usually membranous margined and with a roundish to keeled back; almost always 5 stamens, and one ovary with 2 stigmas. In fruit, perianth segments become sometimes coloured, but mostly keep unchanged, somewhat closing over or spreading from the fruit. Pericarp membranous or sometimes succulent, adherent to or loosely covering the seed. The horizontally orientated seeds are depressed-globular to lenticular, with rounded to subacute margin. The black seed coat is almost smooth to finely striate, rugulose or pitted. 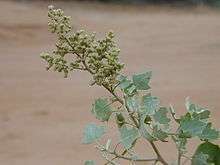 The genus Chenopodium contains several plants of minor to moderate importance as food crops as leaf vegetables – used like the closely related spinach (Spinacia oleracea) and similar plants called quelite in Mexico – and pseudocereals. These include white goosefoot (C. album), kañiwa (C. pallidicaule) and quinoa (C. quinoa). On the Greek island of Crete, tender shoots and leaves of a species called krouvida (κρουβίδα) or psarovlito (ψαρόβλητο) are eaten by the locals, boiled or steamed. 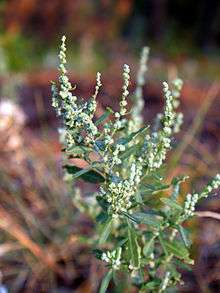 As studied by Kristen Gremillion and others, goosefoots have a history of culinary use dating back to 4000 BC or earlier, when pitseed goosefoot (C. berlandieri) was a staple crop in the Native American eastern agricultural complex, and white goosefoot was apparently used by the Ertebølle culture of Europe. The Proto-Indo-Europeans of the eastern Yamna culture also harvested white goosefoot as an apparent cereal substitute to round out an otherwise mostly meat and dairy diet c. 3500–2500 BCE. 1 2 3 4 5 6 7 Susy Fuentes-Bazan, Pertti Uotila, Thomas Borsch: A novel phylogeny-based generic classification for Chenopodium sensu lato, and a tribal rearrangement of Chenopodioideae (Chenopodiaceae). In: Willdenowia. Vol. 42, No. 1, 2012, p. 5-24. 1 2 Gelin Zhu, Sergei L. Mosyakin & Steven E. Clemants: Chenopodium - In: Wu Zhengyi, Peter H. Raven, Deyuan Hong (Hrsg. ): Flora of China. Volume 5: Ulmaceae through Basellaceae. Science Press/Missouri Botanical Garden Press, Beijing/St. Louis 2003, ISBN 1-930723-27-X, p. 378-. ↑ Chisholm, Hugh, ed. (1911). 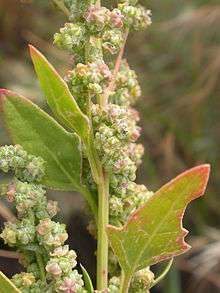 "Chenopodium". Encyclopædia Britannica. 6 (11th ed.). Cambridge University Press. p. 80. Sukhorukov, Alexander P.; Zhang, Mingli (2013). "Fruit and Seed Anatomy of Chenopodium and Related Genera (Chenopodioideae, Chenopodiaceae/Amaranthaceae): Implications for Evolution and Taxonomy". PLoS ONE. 8 (4): e61906. doi:10.1371/journal.pone.0061906. PMC 3633980 . PMID 23626750.